The county has already surpassed the national average and reached 95.3 per cent coverage, with about 370,000 households and businesses now having access to superfast speeds of 24Mbps and above over the Openreach fibre network. Access to superfast broadband across County Durham continues to increase, largely thanks to Openreach’s commercial rollout and the multi-million pound Digital Durham partnership with the county council. Durham County Council lead Digital Durham on behalf of several local authorities including Gateshead Council, North Tyneside Council, South Tyneside Council and the Tees Valley Combined Authority. Cllr Joy Allen, Durham County Council’s cabinet member for transformation, said: “This is wonderful recognition of the work done in County Durham. We know how important it is for people to have superfast download speeds and we’re proud to say that the work undertaken by the Digital Durham programme has contributed to achieving the UK Government 95 per cent target. According to independent website Thinkbroadband.com, if everyone in County Durham ordered the fastest service available to them, the average broadband speed would be 49Mbps, enough to stream nine HD movies simultaneously. Derek Richardson, programme director in the North East for Openreach, which employs more than 1,100 engineers and other workers in the region, said:“This is a great day for both the country and for County Durham. For a number of years, Durham has led the way with the roll-out of this exciting technology, which is providing a major boost for the economy. “We have some of the highest superfast coverage figures, which is a tribute to the hard work of local engineers and the success of the Digital Durham broadband programme. The multi million pound scheme has been one of the largest and most complex engineering projects in the county over recent years and it’s a great example of the public and private sectors working effectively together. Nationally, Openreach chief executive Clive Selley today recognised the “huge contribution” of more than 9,300 Openreach people across the UK following a Government announcement that 95 per cent of the country can now order superfast broadband speeds of at least 24 Megabits per second (Mbps). Openreach has rolled out more than 35 million kilometres of fibre optic cables in an initiative taking more than 145 million man hours. The Department for Digital, Culture, Media and Sport revealed today that it had reached its national target of making superfast broadband available to 95 per cent of the country. This means the vast majority of Britain’s homes and businesses can now order services capable of streaming their favourite Netflix or iPlayer shows, playing online games, responding to emails and surfing the web – all simultaneously, on multiple devices and without interruption. As the UK’s largest digital infrastructure provider, Openreach now offers wholesale fibre broadband services to more than 27.1million British homes and businesses, making up the lion’s share of the total national footprint, with the firm having invested more than £11 billion over the last decade to upgrade and expand its network nationwide. 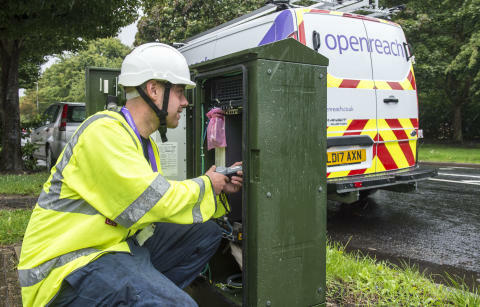 Openreach engineers are still working hard to address the remaining not-spots in partnership with government, local authorities and communities, and to deliver the next generation of ultrafast broadband technologies across the country. The business is currently consulting with its wholesale customers on how to achieve its ambition of making ultrafast (100Mbps+) Fibre-to-the-Premises (FTTP) technology available to 10 million premises by the mid-2020s, and it will be publishing an update on this process in the near future. Clive Selley, said: “Everyone at Openreach is determined to deliver decent broadband speeds to every home and business in Britain. That is our mission, and we won’t be happy until every property from Land’s End to John O’Groats has access to decent speeds. But today represents an important milestone in this mission, and it’s important for me to recognise the huge contribution of our engineers and planners in what has been a titanic and complex engineering project. He added that Openreach wanted to “get on with the job of delivering better broadband to everybody in Britain” and to build “a future-proof, large-scale full fibre network that will reinforce Britain’s position as a leading digital economy in the world”.